The possibilities for drones are almost limitless, from improving crowd security at large events, to tracking impending storms, to delivering precision agriculture. And, of course, they could deliver Amazon packages to your front door. Disagreement about how to regulate the growing field is limiting the Drone Age’s potential in the U.S., said University of Nebraska-Lincoln drone journalism expert Matthew Waite. 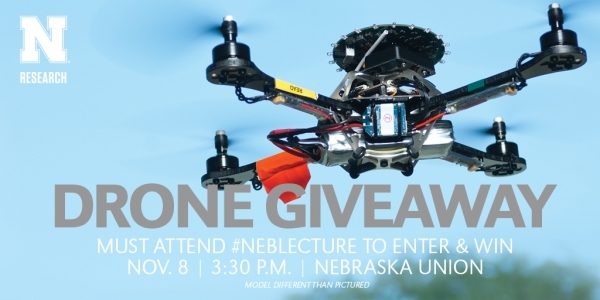 He is presenting the Nov. 8 Nebraska Lecture, “The Drone Age is Here, and We’re Screwing It Up.” The public lecture is at 3:30 p.m. in the Nebraska Union auditorium, 1400 R St., with a reception following. A live webcast is available at research.unl.edu/nebraskalectures. Follow @UNLresearch or #neblecture on Twitter for live updates during the lecture. “To truly unleash this industry, more federal regulation is needed,” said Waite, professor of practice in the College of Journalism and Mass Communications, where he established the country’s first drone journalism lab. Developing a cohesive legal framework for drone operators has been a challenge for lawmakers at all levels. In part, Waite said, this is because the idea of unlimited “flying robots” zooming overhead raises questions about property rights, privacy and free speech. Even more complicated is who gets to decide – local, state and federal lawmakers are jockeying to set the rules. Using the birth of the aviation industry as a historical parallel, Waite’s lecture will explore why federal regulation is key to the full-fledged launch of commercial drones. Local and state drone parameters often muddy the waters by overlapping with existing laws, Waite said, resulting in legal clashes and a revolving door of legislation that may hamstring progress. The U.S. faced similar issues with aircraft. Though the Wright Brothers’ first flights at Kitty Hawk were in 1903, Congress waited until 1926 to pass the landmark Air Commerce Act, which established federal regulation of air commerce. It took another three decades to create the Federal Aviation Administration. The plodding pace reflected anxiety about the new technology, Waite said, and the response to drones has been no different. Federal regulation can help address some of citizens’ legitimate concerns. Waite joined the university in 2011. Previously, he worked for the St. Petersburg Times as a hybrid programmer/journalist, where he developed the fact-checking website Politifact. In 2009, it became the first website to win the Pulitzer Prize. He also has worked as an investigative reporter for the Arkansas Democrat-Gazette and co-founded Hot Type Consulting, a company that builds applications for media outlets. His lecture is part of The Nebraska Lectures: Chancellor’s Distinguished Lecture Series, sponsored by the Research Council, Office of the Chancellor, Office of Research and Economic Development and Osher Lifelong Learning Institute.